Welcome to Day 19 of the 30 day challenge! 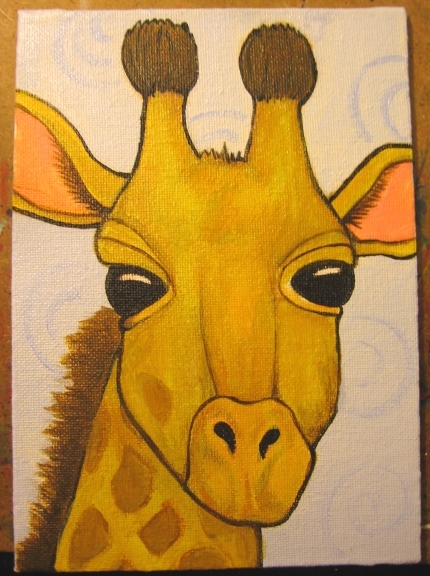 This giraffe was a request by a friend at illustratedatcs.com, intended for a nursery. I offered to add a bunny, but ended up adding a ladybug. On a very tall flower. I think s/he’s pretty cute. My first try was a giraffe in acrylics, because of the painting challenge. I’ve done quite a few paintings recently so wanted to continue the run. But alas! The giraffe, while not finished, was just feeling too somber for a nursery (see below). Anyway, I was under a deadline to produce a giraffe and figured my best chance for success would be ink, my old standby. This entry was posted in Acrylics, Copic Markers, Progression Photos, sketches and tagged beasts, Copic Markers, illustration, pen & ink on January 19, 2014 by The Beast Tender. Cindy the nursery giraffe is too perfect!!! I’m totally in love with it!!! charming, perfect for a baby’s room. Lovely work as always Cindy. I do, about six minutes away by car. I am lucky, I know! Adorable. I like both versions! 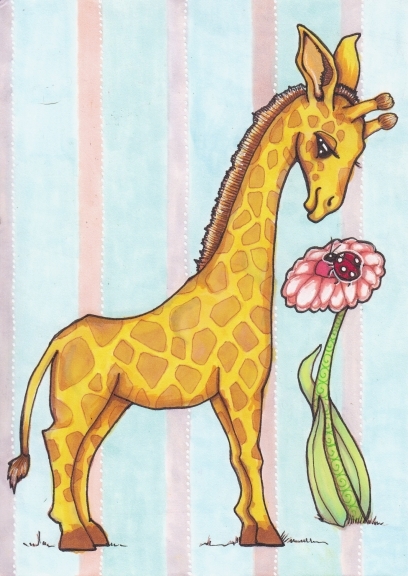 Perfect….love giraffes and this one is adorable and great for a child’s wall….. I love the giraffes, but I really love the picture of your workspace!!! That is always my favorite. OMG, your nursery giraffe came out so CUTE! That is one very lucky baby! I love the challenge giraffe, too. You are so good at imbuing animals with personality! Both of these are very sweet. Love the little ladybug too.